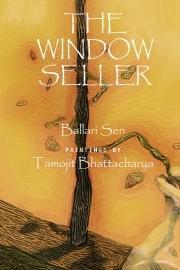 Description of "The Window Seller"
The award winning poet Ballari Sen joins the league of Indian English poets through her new poetry title, The Window Seller. A collection of twenty-four eloquently composed poems that have been mutually inspired by the paintings of the promising artist, Tamojit Bhattacharya of Calcutta. Each poem tells its story—vibrant, appealing and mesmerizing as well. The Window Seller is a work of art and esthetics; a book that will tease your eyes as well as your psyche - a laudable edition from the house of Shambhabi - The Third Eye Imprint. Ballari Sen (Ph. D.) is the Assistant Professor, Department of Bengali, Gokhale Memorial Girls’ College, Calcutta. She is an award winning poet (she received the much coveted Krittibas Puraskar) for her Bengali poetry book, Bihaan Raater Bandish. The Window Seller is her maiden venture in English-language poetry. She is now doing her post-doctoral research work with Prof. Aditi Lahiri, and Dr. Stephen Parkinson on the interface of Portuguese and Bengali in middle Bengali texts at the University of Oxford. Reviews of "The Window Seller"